School children on last subway ride, 1955. Better late than never to celebrate an anniversary: On Jan. 30, 1993 the first segment of the Metro Red Line opened carrying passengers 4.4 miles between Union Station and Westlake/MacArthur Park … to Langer’s Deli for some of the best pastrami in town. (The full Red Line opened to North Hollywood in 2000.) At the end of the first year, ridership — even on this small portion — was already 18,000 boardings a day. That’s pretty good, even compared with the Red Line’s current 140,000 average weekday boardings. This initial segment was LA’s first modern subway. It was not, however, the city’s first subway. That would be the so-called Hollywood Subway, which never quite made it to Hollywood but did allow streetcars to bypass downtown traffic by entering a portal near Glendale Boulevard to a terminus at Hill and 4th streets. The Hollywood Subway was to be the first of several underground electric trains that would help commuters escape what city planners warned was the inevitability of massive traffic problems. The Hollywood Subway opened on Nov. 30, 1925 and ran until L.A.’s inner-city rail began closing. 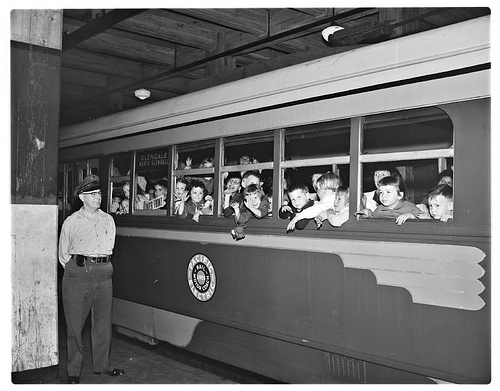 In this photo, school children take a last ride in a Pacific Electric car to the Hollywood Subway terminal in 1955. The train may be gone but despite our many earthquakes, the tunnel still stands.